Combine all ingredients (except orange zest) in a large mixing glass and stir with ice for 30 seconds. 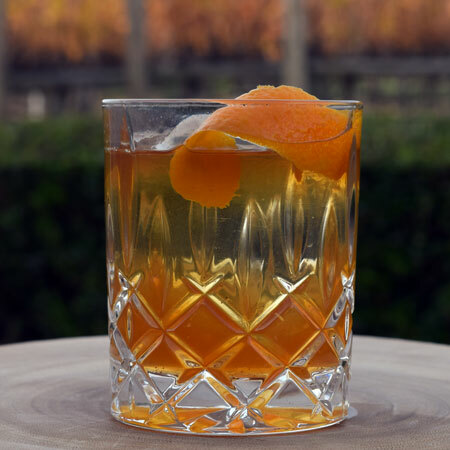 Strain and serve over a giant ice cube, garnish with orange zest. Grind all the spices to a coarse powder. Toast spice powder in a medium pot over low heat until fragrant (approx. 5 minutes), stirring regularly to avoid scorching. Add water and sugar, bring to a boil and reduce heat to simmer for 5 minutes. Cool and strain through sieve or cheesecloth before using. Yields 10 oz.